There is an urgent need for universal influenza vaccines that can control emerging pandemic influenza virus threats without the need to generate new vaccines for each strain. Neutralizing Abs to the influenza virus hemagglutinin glycoprotein are effective at controlling influenza infection but generally target highly variable regions. Abs that can mediate other functions, such as killing influenza-infected cells and activating innate immune responses (termed “Ab-dependent cellular cytotoxicity [ADCC]-mediating Abs”), may assist in protective immunity to influenza. ADCC-mediating Abs can target more conserved regions of influenza virus proteins and recognize a broader array of influenza strains. We review recent research on influenza-specific ADCC Abs and their potential role in improved influenza-vaccination strategies. Influenza virus has a large human and economic toll, with seasonal influenza resulting in ∼300,000–500,000 deaths/y worldwide and more than an estimated $26.8–87.1 billion/y in healthcare costs in the United States alone (1, 2). Yearly vaccination is recommended to reduce the burden of influenza disease. The fraction of severe illness prevented for the 2012–2013 season was estimated by the U.S. Centers for Disease Control and Prevention as being a low 17.3% (confidence interval: 16.2–18.0%), with an estimated half of the U.S. population receiving the influenza vaccine (3). Trivalent influenza vaccine preparations require precise selection of circulating strains (typically an H1N1, H3N2, and type B influenza virus) based on surveillance data and have reduced protection when strains are mismatched (4). Further, seasonal vaccines provide little protection from avian-origin viruses, such as H5N1 and H7N9 (5). With growing demand for broader therapeutic agents (6) and the rising number of viral isolates resistant to current antiviral treatments (7, 8), a broadly protective universal vaccine would be an important development toward curtailing the impact of influenza virus on the human population. Influenza A viruses (IAVs) are enveloped RNA viruses belonging to the family Orthomyxoviridae. The genome comprises eight ssRNA segments that encode for 11 distinct polypeptides, including 8 structural viral proteins and 3 nonstructural proteins (Fig. 1A). The entry and release of influenza virus from host cells is mediated by the surface glycoproteins hemagglutinin (HA) and neuraminidase (NA), respectively. Following receptor-mediated endocytosis, the reduced pH within endosomes triggers a conformational change in HA to facilitate fusion of viral and host cell membranes and release into the host cytosol. The transmembrane M2-ion channel protein is involved in acidification of the virion, which is essential for uncoating of the virus. The internal components of the influenza virus consist of matrix 1 protein (M1); the ribonucleoprotein complex, which consists of the viral RNA segments; the polymerase complex proteins polymerase basic 1 (PB1), polymerase basic 2, and polymerase acid; and nucleoprotein (NP). Nonstructural protein 1, nonstructural protein 2, and PB1 frame 2 are only found within infected cells and are responsible for overcoming host immune mechanisms (9) (Fig. 1A). Influenza virus and surface HA structure. (A) Influenza virus showing internal and external protein structure. (B) Influenza HA trimer; globular head (red) and stem region (green). Images were generated from the crystal structure of HA from A/Aichi/2/1968 (H3N2) virus (PDB code: 2HMG) using PyMOL software. Many studies have focused on the induction of broadly neutralizing Abs (Nabs) or cross-reactive CTLs to define immune correlates of protection from influenza virus infection. CTLs targeting peptides from NP or M1 were shown to be effective in protecting from severe influenza infection (10–13) and correlated with the reduction of symptomatic influenza disease in humans (13, 14). Further, CTLs recognizing a broad range of influenza viruses are present in healthy human subjects (15, 16). Conversely, Nabs directed to HA or NA can inhibit virus entry or prevent virus release from host cells, respectively (17, 18). Influenza vaccine studies primarily measure hemagglutination inhibition (HI) titers, such Abs that mediate HI target epitopes surrounding the receptor-binding site of influenza HA (Fig. 1B) (19, 20). However, Abs that mediate HI tend to be highly specific for the infecting virus or vaccine strain and amenable to escape through point mutations or glycosylation of the receptor binding site of the globular head. In contrast, subsets of Nabs exist that do not mediate HI and bind the conserved helix-A region sitting between the HA1 and HA2 regions (known as anti-stem Abs) (21–23). The stem region is highly conserved among influenza viruses, and anti-stem Abs tend to mediate their neutralization activity by either blocking viral fusion with, or preventing cleavage of, the HA protein (24, 25). Vaccine regimens that target the HA stem region have given promising results in mouse models but have yet to be translated into human clinical studies (26–28). Abs induced toward influenza virus can mediate a number of nonneutralizing functions, including complement-mediated lysis (29, 30), phagocytosis (31), and Ab-dependent cellular cytotoxicity (ADCC) (32–36). In some instances, these nonneutralizing Abs mediate distinct antiviral activity; however, in other cases, these additional functions can increase the potency of Nabs. In this review, we describe previous studies on influenza-specific ADCC and new technical developments in the study of influenza-specific ADCC that may aid in future vaccine development. ADCC uses effector arms of both the innate and adaptive immune responses to kill target cells (Fig. 2). ADCC is initiated by secreted IgG Abs (IgG1 or IgG3 subtypes in humans and IgG2a or IgG2b subtypes in mice) binding to Ags on the surface of target cells. Effector cells, such as NK cells (but also neutrophils and monocytes), which in humans express the activating FcγRIIIα (CD16) receptor (in mice the FcγRIV receptor has the highest affinity for IgG2a), are then able to bind to the Fc region of the surface-bound Ab (37, 38). Ligation of the CD16 receptor on the effector cell leads to phosphorylation of the C-terminal ITAM to activate Ca2+-dependent signaling pathway, resulting in the release of preformed granzyme B and perforin granules from endosomes (39). Both granzyme B and perforin cause DNA fragmentation and apoptosis of the target cell. 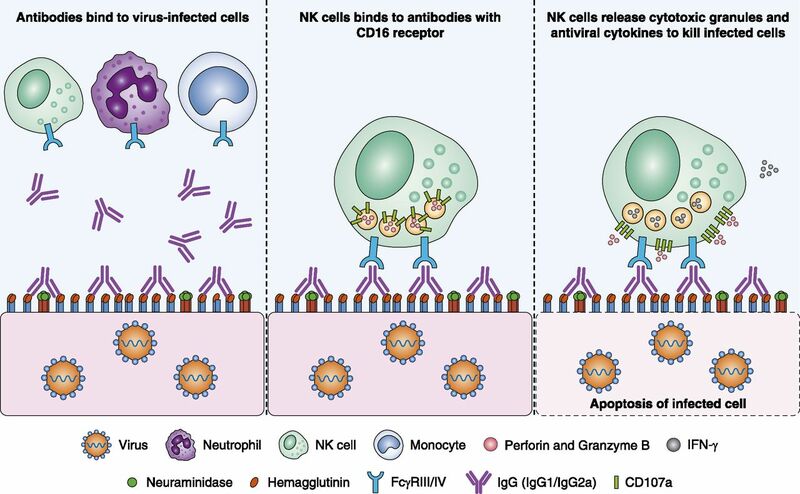 Additionally, ligation of the CD16 receptors on effector cells can result in the secretion of several antiviral cytokines and chemokines, including IFN-γ, and TNF, and β-chemokines (e.g., MIP-1α and MIP-1β), which have important antiviral and immunopathological properties (40, 41). Schematic diagram of ADCC to influenza virus–infected cells. IgG Abs (IgG1/IgG3 in humans or IgG2a/IgG2b in mice) bind to viral Ags expressed on the surface of influenza virus–infected cells (left panel). Effector cells, such as NK cells (also neutrophils or monocytes), bind to the Ab Fc-region using their FcγRIII receptor (in mice FcγRIV, middle panel). Upon Ab ligation, cytotoxic granules are released, and antiviral cytokines are expressed (right panel). This results in apoptosis of the infected cell and a reduction in viral replication. Early studies performed during the late 1970s and the early 1980s established a role for ADCC against influenza virus. In 1977 and 1978, Greenberg et al. (32, 33) suggested that lymphocytes in peripheral blood were capable of mediating cytotoxicity toward influenza virus–infected cells in the presence of small quantities of Abs secreted from PBMCs. PBMCs isolated from healthy volunteers were found to mediate robust cytotoxicity toward either HeLa cells or BHK-21 cells infected with H3N2 (A/Hong Kong/2/68) virus and labeled with [51Cr]. Greenberg et al. (42) later confirmed that the presence of HA-specific Abs secreted by PBMCs correlated with the ability of lymphocytes to mediate cytotoxicity against influenza virus–infected cells. This is consistent with our recent studies showing that cross-reactive ADCC-mediating Abs against a broad range of HA and NA proteins from IAV strains were present in serum from healthy volunteers (36). Greenberg et al. (32, 42) also showed that vaccination with an inactivated influenza vaccine or infection with influenza virus resulted in increased cytotoxicity from PBMCs within 7 d. Hashimoto et al. (34) performed follow-up studies showing that ADCC-mediating Abs were found in serum from children recently vaccinated with either inactivated or live-attenuated vaccines or infected with influenza virus. They suggested that the cytotoxicity was likely the result of NK cell activity. Our recent studies show that infection of macaques with a seasonal H1N1 virus induces cross-reactive ADCC-mediating Abs toward a heterologous H1N1 virus. These ADCC Abs declined to lower, but still detectable levels, by 30 d postinfection. However, the ADCC Abs expanded significantly within 7 d postinfection with a heterologous H1N1 virus, highlighting the infection-mediated induction of memory B cells capable of producing ADCC Abs (43). Recent studies by our group showed that healthy humans have broad cross-reactive ADCC-mediating Abs, likely as a result of multiple prior influenza infections. We found that young adults with no known prior exposure to (consistent with a lack of HI Abs that recognized) a 1968 H3N2 virus had robust ADCC-mediating Abs to this strain (36). In our studies, most influenza virus–specific ADCC-mediating Abs induced via vaccination or infection were shown to be broadly reactive to strains within a given subtype (32, 34, 44–46). However, we detected cross-reactive ADCC-mediating Abs toward avian H5N1 and H7N7 strains in some individuals in the absence of prior exposure (36). Presumably, these cross-reactive ADCC-mediating Abs target conserved regions of the influenza HA, including the stem region. This is consistent with our recent studies showing a reduction in titers of ADCC-mediating Abs when measuring responses against the HA1 protein compared with the whole HA protein (S. Jegaskanda, K. Vandenberg, K.L. Laurie, L. Loh, M. Kramski, W.R. Winnall, K. Kedzierska, S. Rockman, and S.J. Kent. manuscript in preparation). Such ADCC-mediating Abs are likely expanded following heterologous influenza infection (43, 47, 48). The levels of cross-reactive ADCC-mediating Abs in healthy humans make measuring the generation of new ADCC responses difficult. Abs and NK cells capable of mediating ADCC are detectable in cord blood samples, suggesting that ADCC-mediating Abs are present at low levels in all individuals throughout their lifetime (35). This may shape the newborn’s immune response to influenza virus, with the broader ADCC-mediating maternal Abs having a greater protective effect on the newborn (49, 50). We speculate that, in addition to the waning of Nabs, the loss of maternal ADCC-mediating Abs following cessation of breastfeeding may lead to increased influenza infections in infants. More detailed studies on the induction of cross-reactive Abs by multiple infections and the influence of ADCC-mediating Abs on the protection of infants are required to make such conclusions. The characterization of protective Ab responses to influenza virus in mouse models has typically focused on Nab function. However, recent studies suggest that the nonneutralizing functions provided by the Fc region of the Ab are important for the potency and the protective ability of HA-specific Abs (22, 51). A study by Corti et al. (22) showed that the broadly neutralizing human FI6 Ab attributes most of its in vivo activity to its FcR-binding properties. Mice administered 3 mg/kg of the FcR mutant (termed FI6-LALA) FI6 Ab had a 60% reduction in survival compared with FI6 Ab or FI6 complement mutant (termed FI6-KA) when challenged with a lethal dose of PR8 virus. However, the transfer of human IgG1 Abs into mice that express mouse FcR may be suboptimal. A recent study by DiLillo et al. (52) showed that administration of 4 mg/ml of a mouse IgG2a form of FI6 Ab (which can mediate ADCC in mice) protected mice from lethal challenge, whereas 4 mg/ml of mouse IgG1 FI6 Ab form (which does not mediate ADCC in mice) did not. The protection afforded by mouse IgG2a FI6 Ab was abolished when administered to Fcer1g−/− mice (mice lacking the FcRγ-chain). Further, the human IgG1 form of the FI6 Ab was directly shown to mediate ADCC toward influenza virus–infected target cells. This confirms the importance of ADCC for the protective activity of the FI6 broadly Nab in mice. DiLillo et al. (52) provide further support for the in vivo use of influenza-specific ADCC, showing that, for HA stem Nabs, the subclass and FcR function are important for protection from lethal influenza infection. Mice administered the mouse IgG2a subclass of the anti-stem 6F12 broadly Nab showed reduced weight loss and increased survival following challenge with a lethal dose of PR8 virus compared with those administered the mouse 6F12 IgG1 subclass (does not mediate ADCC) or a 6F12 FcγR-binding–deficient Ab (DA265). The protection provided by the IgG2a 6F12 Nab in mice was FcγR dependent, because administration of IgG2 6F12 to either Fcγ-chain–deficient mice (Fcer1g−/− mice; which lack FcγRI, FcγRII, FcγRIII, and FcγRIV) or FcRα-null mice (which lack FcγRI, FcγRIIb, FcγRIII, and FcγRIV) resulted in reduced survival following lethal challenge with PR8. The ability of stem Abs to mediate ADCC was shown by the activation of donor NK cells in the presence of human IgG1 6F12 and A549 cells infected with PR8 virus. In addition, DiLillo et al. (52) showed that the anti-stalk Abs 2G02, 2B06, and 1F02 protected mice from A(H1N1)pdm09 virus challenge in a FcR-dependent manner. Not surprisingly, FcR binding was critical for the potent protection provided by anti-stem Abs because the mutant form of 6F12, deficient in FcR binding (DA265), afforded protection only at concentrations >16 mg/kg, whereas 4 mg/kg of unmodified IgG2a 6F12 provided complete protection from lethal PR8 challenge. Indeed, these findings may explain the ability of anti-stem Abs CR9114 and CR8043 to protect mice from lethal challenge with a type B virus or H7N7 virus, respectively, although these Abs did not mediate in vitro neutralization of these viruses (21, 53). However, the ability of Abs CR9114 and CR8043 to mediate ADCC toward these strains needs to be assessed. The investigation of stem Abs’ versus globular head Abs’ ability to mediate ADCC is particularly interesting. DiLillo et al. (52) suggested that only anti-stem Abs can bind in the correct confirmation to ligate FcRs. In their study, the one strain-specific anti-HA head Ab (PY102) investigated was inefficient at mediating FcγR binding and ADCC activity; however, more Abs to the globular head of HA need to be tested before clear conclusions can be drawn. Further, a polyclonal anti-HA ADCC response may provide greater ligation of CD16, as seen for HIV ADCC (54). Clearly, a larger subset of anti-HA head Abs needs to be tested to determine their overall potential to mediate ADCC. Our study and other studies characterized the role of NK cells in mediating ADCC against influenza virus–infected cells (34–37). However, other cells at the site of influenza infection, including neutrophils and alveolar macrophages, express CD16 receptors and could mediate ADCC activity. The relative importance of different cell subtypes as effectors of ADCC activity is unclear. In April 2009, a novel swine-origin H1N1 influenza virus entered the human population and caused the first pandemic of the 21st century (55–58). In contrast to seasonal influenza, which has the highest morbidity and mortality in the elderly, it was younger individuals (<60 y of age) who were most affected during the 2009 pandemic. Older individuals seemed to demonstrate a level of protection against severe A(H1N1)pdm09 infection (58, 59). According to Hancock et al. (59), a proportion of individuals (39/115, 34%) born before 1950 (>59 y of age) had detectable cross-reactive Nab titers against the A(H1N1)pdm09 virus. However, the presence of Nabs in some individuals may only partially explain the reduced incidence of severe (H1N1)pdm09 virus infection in individuals >60 y of age. We recently showed that of the individuals >45 y of age with undetectable HI titers to A(H1N1)pdm09, nearly all (28/31, 90%) had ADCC-mediating Abs to the A(H1N1)pdm09 virus prior to the 2009 pandemic (44). Numerous animal studies showed that infection with seasonal H1N1 viruses, particularly with H1N1 viruses circulating pre-1960, can provide a level of protection from severe A(H1N1)pdm09 virus infection (21, 60–63). In studies in which Nabs against A(H1N1)pdm09 could not be detected, the levels of nonneutralizing binding Abs correlated closely with protection from severe A(H1N1)pdm09 infection (12, 61). Indeed, our studies showed that previous infection of macaques with seasonal H1N1 virus induced cross-reactive ADCC-mediating Abs toward A(H1N1)pdm09 (43). The expansion of cross-reactive ADCC-mediating Abs targeting the stem region of the influenza virus HA fits well with epidemiological studies. Future passive-transfer studies and isolation of mAbs from donor samples prior to the 2009 pandemic are required to determine the targets and protective ability of polyclonal ADCC-mediating Abs induced by seasonal H1N1 infection. Vaccination strategies that target internal proteins of influenza virus, namely NP and M1, have shown promise in animal models. Amino acid sequences of NP and M1 are highly conserved across different IAV subtypes and strains (i.e., ∼90% sequence identity), making these proteins attractive vaccine targets. Until recently, only T cell–mediated immunity toward internal proteins was considered plausible for effective heterologous protection from influenza virus infection. However, protein- or vector-based vaccine constructs containing NP can induce nonneutralizing Abs (64–67). Passive transfer of nonneutralizing polyclonal Abs or mAbs toward NP was associated with protection from lethal influenza challenge in mice (64, 68), although the mechanism of Ab-mediated protection remains unclear. Of interest, studies showed that intracellular NP Ag is transiently expressed on the surface of influenza virus–infected cells (69, 70) and, therefore, could represent a target for ADCC. Bodewes et al. (71) investigated the in vitro Fc-mediated effector functions of anti-NP Abs, demonstrating that a human anti-NP Ab did not mediate neutralization or complement-dependent cytotoxicity or improve presentation by opsonization. Studies on HIV ADCC by our group showed that ADCC can be mediated to peptides derived from internal HIV proteins, including Pol and Vpu (72, 73). Our limited studies in macaques suggest that anti-NP Abs mediate ADCC activity, because anti-NP Abs could activate macaque NK cells in vitro (46). Further studies are required to determine whether virus-infected cells expressing NP can be killed by ADCC, as well as the ability of anti-NP ADCC-mediating Abs to mediate protection in vivo. The targeting of conserved regions of NP or other internal proteins (M1, PB1) for the induction of ADCC-mediating Abs may be a very useful strategy for vaccine design (74, 75). The development of flow cytometry–based ADCC assays has been important in the assessment and understanding of the role of ADCC responses to influenza virus in humans. Recent studies by our group (36, 43) and other investigators (52, 76) described assays that measure NK cell activation following incubation of donor PBMCs with either (mAbs or polyclonal IgG) Ab-coated infected target cells or Ab–Ag complexes on coated plates. In our studies, we coated recombinant influenza HA proteins onto a 96-well plate, incubated them with serum or purified Ig, and added PBMCs from healthy donors. We then measured the activation of healthy donor NK cells by assessing either intracellular IFN-γ or surface CD107a expression via flow cytometry. Alternatively, we infected respiratory cell lines with influenza virus and measured the elimination of virus-infected target cells in the presence of ADCC-mediating Abs and donor NK cells (36, 77). The latter assay allowed us to associate the Ab-mediated elimination of virus-infected target cells with the activation of NK cells. Further refinements to these assays through studying subsets of NK cells, measuring the relative levels of influenza Ags expressed on infected target cells, and improving the throughput of ADCC assays via the use of NK cell lines will be of benefit for future influenza ADCC studies. Recent studies established a role for ADCC-mediating Abs in protection from influenza virus infection. The importance of ADCC function of Abs is becoming increasingly apparent in other fields, with recent studies suggesting that the HIV vaccine–mediated protection observed during the Thai RV144 HIV study was due, in part, to ADCC-mediating Abs (78). We speculate that the induction of ADCC-mediating Abs to the conserved HA stem region may result in a partially successful universal influenza vaccine. However, a stem-specific Ab response may be difficult to generate in all individuals, and the synthesis of large quantities of correctly folded recombinant HA stem without the immunogenic globular head region will be technically challenging. Despite this, we know that the potency of HA stem Abs is greatly diminished if they do not have ADCC function. The screening of distinct stem-specific Abs that bind, but do not mediate neutralization, is possible with current in vitro ADCC assays. Our current data suggest that most healthy donors have persistent low-level cross-reactive ADCC-mediating Abs. These cross-reactive Abs are found in individuals in the absence of detectable neutralization and suggest that they are a distinct subset. The presence of these low-level Abs implies that a pool of cross-reactive memory B cells may exist that could be expanded with the appropriate vaccine strategy. Future studies should aim to isolate and characterize these B cells and Abs to determine whether they are different from classical stem Abs. Newly developed assays and the current interest in ADCC-mediated responses to influenza virus are important for the diversification of influenza immunity studies. The use of these assays in other laboratories worldwide will drive a shift in perspective away from “neutralizing-only” Abs to Abs with a range of other effector functions that also contribute to effective immunity. It is clear that ADCC-mediating Abs are found in most individuals, and such Abs are cross-reactive against a broad range of influenza subtypes. This represents a unique turning point in our field and provides a possible avenue to assist in the development of a universal influenza vaccine. This work was supported by Australian National Health and Medical Research Council Awards 628331 and 1023294. The Melbourne World Health Organization Collaborating Centre for Reference and Research on Influenza is supported by the Australian Government Department of Health.
. 2007. The annual impact of seasonal influenza in the US: measuring disease burden and costs. Vaccine 25: 5086–5096. World Health Organization, Influenza (Seasonal) Fact Sheet No. 211, March 2014. Available at: http://www.who.int/mediacentre/factsheets/fs211/en/. Accessed: June 12, 2014.
. 2013. Estimated influenza illnesses and hospitalizations averted by influenza vaccination - United States, 2012-13 influenza season. MMWR Morb. Mortal. Wkly. Rep. 62: 997–1000.
. 2014. 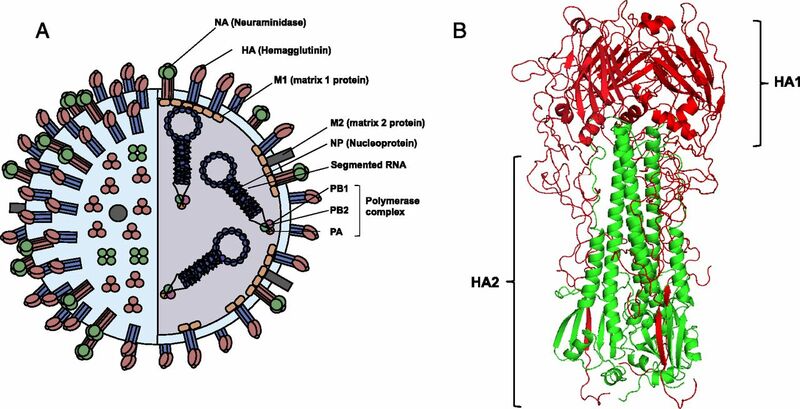 Evaluation of heterosubtypic cross-protection against highly pathogenic H5N1 by active infection with human seasonal influenza A virus or trivalent inactivated vaccine immunization in ferret models. J. Gen. Virol. 95: 793–798.
. 2011. Oseltamivir-resistant influenza viruses circulating during the first year of the influenza A(H1N1) 2009 pandemic in the Asia-Pacific region, March 2009 to March 2010. Euro Surveill. 16(3).
. 2012. Antiviral resistance during the 2009 influenza A H1N1 pandemic: public health, laboratory, and clinical perspectives. Lancet Infect. Dis. 12: 240–248. Knipe, D. M., and P. M. Howley. 2006. Fields Virology. Lippincott Williams & Wilkins, Philadelphia.
. 1978. Transfer of specific cytotoxic T lymphocytes protects mice inoculated with influenza virus. Nature 273: 238–239.
. 2011. Cross-reactive T cells are involved in rapid clearance of 2009 pandemic H1N1 influenza virus in nonhuman primates. PLoS Pathog. 7: e1002381.
. 2013. Cellular immune correlates of protection against symptomatic pandemic influenza. Nat. Med. 19: 1305–1312.
. 2013. Acute emergence and reversion of influenza A virus quasispecies within CD8+ T cell antigenic peptides. Nat. Commun. 4: 2663.
. 1981. Structural identification of the antibody-binding sites of Hong Kong influenza haemagglutinin and their involvement in antigenic variation. Nature 289: 373–378.
. 1982. The antigenic structure of the influenza virus A/PR/8/34 hemagglutinin (H1 subtype). Cell 31: 417–427.
. 1979. Determinants of immunity to influenza infection in man. Br. Med. Bull. 35: 69–75.
. 2012. Highly conserved protective epitopes on influenza B viruses. Science 337: 1343–1348.
. 2011. A highly conserved neutralizing epitope on group 2 influenza A viruses. Science 333: 843–850.
. 2013. Mechanisms of hemagglutinin targeted influenza virus neutralization. PLoS ONE 8: e80034.
. 2009. Antibody recognition of a highly conserved influenza virus epitope. Science 324: 246–251.
. 2014. Assessment of influenza virus hemagglutinin stalk-based immunity in ferrets. J. Virol. 88: 3432–3442.
. 2014. Guiding the immune response against influenza virus hemagglutinin toward the conserved stalk domain by hyperglycosylation of the globular head domain. J. Virol. 88: 699–704.
. 2013. Chimeric hemagglutinin influenza virus vaccine constructs elicit broadly protective stalk-specific antibodies. J. Virol. 87: 6542–6550.
. 2011. A protective role for complement C3 protein during pandemic 2009 H1N1 and H5N1 influenza A virus infection. PLoS ONE 6: e17377.
. 2011. Serum concentrations of complement anaphylatoxins and proinflammatory mediators in patients with 2009 H1N1 influenza. Microbiol. Immunol. 55: 191–198.
. 1978. Lymphocyte cytotoxicity to influenza virus-infected cells: response to vaccination and virus infection. Infect. Immun. 20: 640–645.
. 1977. Lymphocyte cytotoxicity to influenza virus-infected cells. II. Requirement for antibody and non-T lymphocytes. J. Immunol. 119: 2100–2106.
. 1983. Ability of human cord blood lymphocytes to mediate antibody-dependent cellular cytotoxicity against influenza virus-infected cells. Infect. Immun. 42: 214–218.
. 1988. Structure and function of Fc receptors on macrophages and lymphocytes. J. Cell Sci. Suppl. 9: 45–65.
. 1997. IgG binding sites on human Fc gamma receptors. Int. Rev. Immunol. 16: 57–85.
. 2013. Natural killer cell mediated antibody-dependent cellular cytotoxicity in tumor immunotherapy with therapeutic antibodies. Front. Immunol. 4: 76.
. 1998. Natural killer cells from human immunodeficiency virus (HIV)-infected individuals are an important source of CC-chemokines and suppress HIV-1 entry and replication in vitro. J. Clin. Invest. 102: 223–231.
. 1979. Cell cytotoxicity due to specific influenza antibody production in vitro after recent influenza antigen stimulation. Proc. Natl. Acad. Sci. USA 76: 4622–4626.
. 1980. Antibody reactive in antibody-dependent cell-mediated cytotoxicity following influenza virus vaccination. J. Med. Virol. 6: 203–211.
. 2012. Pandemic H1N1 influenza vaccine induces a recall response in humans that favors broadly cross-reactive memory B cells. Proc. Natl. Acad. Sci. USA 109: 9047–9052.
. 2012. Seasonal H1N1 influenza virus infection induces cross-protective pandemic H1N1 virus immunity through a CD8-independent, B cell-dependent mechanism. J. Virol. 86: 2229–2238. 2001. Influence of maternal antibodies on neonatal immunization against respiratory viruses. Clin. Infect. Dis. 33: 1720–1727.
. 2001. Passively acquired antibodies suppress humoral but not cell-mediated immunity in mice immunized with live attenuated respiratory syncytial virus vaccines. J. Immunol. 167: 3910–3918.
. 2013. Broadly neutralizing antiviral antibodies. Annu. Rev. Immunol. 31: 705–742.
. 2014. A common solution to group 2 influenza virus neutralization. Proc. Natl. Acad. Sci. USA 111: 445–450.
. 2012. Antibody-dependent cellular cytotoxicity against primary HIV-infected CD4+ T cells is directly associated with the magnitude of surface IgG binding. J. Virol. 86: 8672–8680.
. 2009. Interim analysis of pandemic influenza (H1N1) 2009 in Australia: surveillance trends, age of infection and effectiveness of seasonal vaccination. Euro Surveill. 14(31). 14.
. 2009. Severe respiratory disease concurrent with the circulation of H1N1 influenza. N. Engl. J. Med. 361: 674–679.
. 2010. Protection of mice against lethal challenge with 2009 H1N1 influenza A virus by 1918-like and classical swine H1N1 based vaccines. PLoS Pathog. 6: e1000745.
. 2012. Effect of priming with H1N1 influenza viruses of variable antigenic distances on challenge with 2009 pandemic H1N1 virus. J. Virol. 86: 8625–8633.
. 2010. Multiple infections with seasonal influenza A virus induce cross-protective immunity against A(H1N1) pandemic influenza virus in a ferret model. J. Infect. Dis. 202: 1011–1020.
. 2013. Sequential seasonal H1N1 influenza virus infections protect ferrets against novel 2009 H1N1 influenza virus. J. Virol. 87: 1400–1410.
. 2011. Contributions of antinucleoprotein IgG to heterosubtypic immunity against influenza virus. J. Immunol. 186: 4331–4339.
. 2011. Regulation of antinucleoprotein IgG by systemic vaccination and its effect on influenza virus clearance. J. Virol. 85: 5027–5035.
. 1987. Purified influenza virus nucleoprotein protects mice from lethal infection. J. Gen. Virol. 68: 433–440.
. 1993. Heterologous protection against influenza by injection of DNA encoding a viral protein. Science 259: 1745–1749.
. 2008. A novel role for non-neutralizing antibodies against nucleoprotein in facilitating resistance to influenza virus. J. Immunol. 181: 4168–4176.
. 1977. Early presence of ribonucleoprotein antigen on surface of influenza virus-infected cells. Nature 266: 52–54.
. 1981. Expression of influenza A virus internal antigens on the surface of infected P815 cells. J. Immunol. 126: 1814–1819. Bodewes, R., M. M. Geelhoed-Mieras, J. Wrammert, R. Ahmed, P. C. Wilson, R. A. Fouchier, A. D. Osterhaus, and G. F. Rimmelzwaan. 2013. In vitro assessment of the immunological significance of a human monoclonal antibody directed to the influenza A virus nucleoprotein. Clin. Vaccine Immunol. 20: 1333–1337.
. 2011. Pol as a target for antibody dependent cellular cytotoxicity responses in HIV-1 infection. Virology 412: 110–116.
. 2013. Specific antibody-dependent cellular cytotoxicity responses associated with slow progression of HIV infection. Immunology 138: 116–123.
. 2013. Cooperativity between CD8+ T cells, non-neutralizing antibodies, and alveolar macrophages is important for heterosubtypic influenza virus immunity. PLoS Pathog. 9: e1003207.
. 2011. Universal vaccine based on ectodomain of matrix protein 2 of influenza A: Fc receptors and alveolar macrophages mediate protection. J. Immunol. 186: 1022–1031.
. 2013. Vaccine-induced plasma IgA specific for the C1 region of the HIV-1 envelope blocks binding and effector function of IgG. Proc. Natl. Acad. Sci. USA 110: 9019–9024.
. 2012. Immune-correlates analysis of an HIV-1 vaccine efficacy trial. N. Engl. J. Med. 366: 1275–1286.